Could unmanned all-terrain vehicles, driverless trucks and Hoverbike drones save lives and de-risk the last mile of logistics on the frontline? Aworld-first in the US has seen British soldiers controlling 4x4s with Xbox-style controllers and a UK driverless truck leading American trucks in an unmanned convoy. 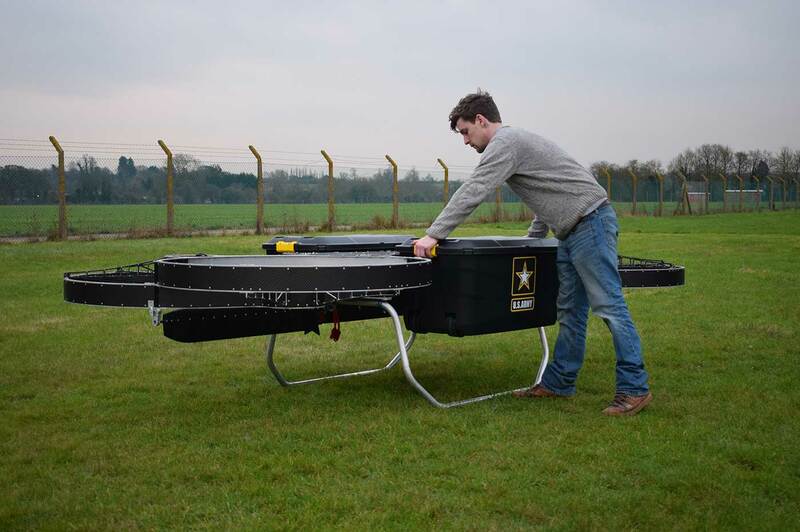 The UK is working with the US military on autonomous resupply, providing a glimpse into the future of getting much-needed supplies to the front line. In a week-long exercise in Michigan, the UK Ministry of Defence’s (MoD) Defence Science and Technology Laboratory (Dstl) and organisations from the US Army’s Research, Development and Engineering Command (RDECOM) have tested an all-terrain 4x4 vehicle controlled by an Xbox-style controller, driverless trucks in convoy and Hoverbike drones for delivering supplies in the most dangerous “last mile” up to the battlefield. “This is the first time that we have created a UK-US coalition semi-autonomous leader-follower convoy to bring to life concepts which will provide solutions to de-risk the last mile of logistics support to the front line,” says Pete Stockel, innovation autonomy challenge lead for Dstl. The project between the UK and the US was first announced at the Farnborough Airshow in 2016. Stockel says the project could be a step-change in how operational risk is managed, costs reduced and—ultimately—how lives can be saved by harnessing rapidly-evolving technology. Under the Autonomous Last Mile resupply challenge, Dstl and the Defence and Security Accelerator (DASA) brought together a wide range of military and industry partners to join commercial-off the-shelf (COTS) suppliers with novel ideas and tech start-ups in producing a futuristic demonstration of how UK and US forces’ tactical resupply might one day operate. This is a new way of coordinating and delivering vital supplies to front-line operations, aiming to reduce risk to troops and provide on-demand delivery of food, fuel or ammunition to the front line. 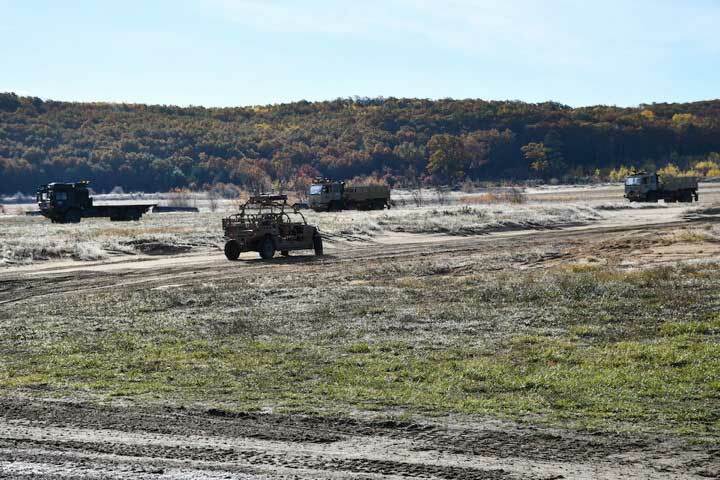 The Coalition Assured Autonomous Resupply (CAAR) demonstration, the first in a three-year project to bring concepts to life, marked initial demonstration of unmanned tactical resupply technologies in the three areas. The line-haul convoy marks the first time that a UK-US collaboration has joined together in this format, with a British Army MAN SV 6-tonne truck as a “leader” vehicle in the convoy, followed by two US Light Medium Tactical Vehicles (LMTV) trucks. Travelling at speeds of up to 25 mph, the vehicles used integrated robotics to make decisions about speed, steering and other driving functions. The Unmanned Aerial Vehicles demonstrated included the British-developed Malloy Aeronautics Hoverbike. An advanced prototype quadcopter drone, it can deliver more than 100 kg of supplies, using a simple tablet controller. Unveiled for the first time, this version of the Hoverbike could also potentially be used for humanitarian aid and disaster relief missions. The 4x4 vehicle tested was a tele-operated Polaris MRZR, fitted with advanced sensors, cameras and GPS, and operated by a joint UK-US trials team. Using an adapted Xbox game console controller, Corporal Mortimer and Lance Corporal Thorne remotely ‘drove’ the 4x4 around the area to simulate an off-road task. The UK MoD is spending 1.2% of its £36 billion defence budget on science and technology. In September Defence Minister Harriett Baldwin announced the 25 winners of the Last Mile Challenge, up-and-coming tech start-ups and entrepreneurs hoping to bring innovative solutions to resupply the frontline. Any entrepreneurs can apply to Pitch@Palace Series 9.0, the theme of which is “Data, Intelligence, and The Future of Security”. A Defence themed On Tour Event is scheduled to take place in London on 31 January 2018.